Price: $7.99 $17.99 55.59% off i The regular prices might have a slight change due to amazon seller's control. ►EASY TO USE ◄ The scale features only two buttons for ease of use. One for quick measurement conversions (lb (oz), g, ml, and fl.oz) and one to quickly change modes - (weight/water/milk). ►MULTIFUNCTIONAL◄ The TARE function allows you to measure individual food items while also keeping track of the total weight of all items placed on the scale. The scale also features a low battery and overload warning function. Its ‘Auto off’ feature turns the scale off if not used for 2 minutes. ►PROFESSIONAL USE ◄ The removable bowl design is great for measuring mixed ingredients and tare measurements. 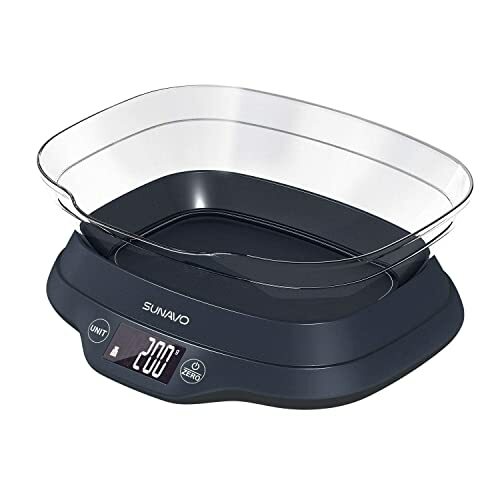 The scale also comes with a 1 Year Warranty from SUNAVO. After-sales Service:support@isunavo.com. Digital kitchen scale is perfect for recipes and macros counting It is very accurate, size is big enough but not too bulky, you can adjust to whatever unit you prefer to measure in, comes with a multiuse lid/bowl, battery operated, looks good in the kitchen. It would be nice if it came with a set of measuring spoons and cups etc, not necessary, but could be priced a bit higher and look for appealing when buying if it came with accessories. Great for chefs doing specific recipes, or anyone who likes cooking/baking, perfect for health conscious people that count their macros. I am really enjoying this kitchen scale. I recently started using my fitness pal to count my calories and macros, and this kitchen scale has been my best friend when making sure I document right. It is a great product. Hey,come to try 11lb/5kg Digital Kitchen Food Scale with Bowl Zero/Tare Function Accurate LCD Display for Coffee Brewing Baking Cooking now.It's a trial rebates.